It’s Swansea, but not as you know it. This fly-through video commissioned by Swansea Council takes the viewer on a magic carpet ride across a city-scape of the future. The stuff of science fiction? A planning officer’s dream somehow downloaded onto a digital file? If all the current public and private sector-led regeneration projects on the drawing board materialise, then Swansea won’t look a million miles off from what is depicted, on a sunny day, of course. The fly-through by Swansea firm iCreate starts with a soaring aerial shot, zooms into a refurbished Castle Square and we’re off – gliding along a new-look commercial and leisure-led city centre, heading across a new bridge across Oystermouth Road towards an indoor arena, coastal park and hotel. Next, we fly along a greened-up West Way, past a huge new office building opposite the Grand Theatre and onto The Kingsway and another major office development. Then we zoom at speed along the River Tawe where we check out the Liberty Stadium, the new Penderyn whisky distillery and visitor centre at Hafod-Morfa Copperworks. Finally, we float up Kilvey Hill above the gondola rides and luge runs, with arguably Swansea’s finest asset – the south-facing bay – in the distance. You won’t see a Swansea Bay tidal lagoon, or any electrified train lines, however. So, how are these various schemes faring? Councillors on a scrutiny panel heard more at a meeting. Here we report on the latest updates. Public opinion on The Kingsway is shifting from “another council c**k-up” to “it’s looking very nice”, according to a Swansea councillor. Cllr Terry Hennegan told the scrutiny panel that taxi drivers he spoke to said the new road layout was easier to drive along than before. Council officers, who were giving updates on major city centre projects, said the £12 million scheme to redesign The Kingsway and some surrounding streets was on budget and on time. Huw Mowbray, development and regeneration strategic manager, said contractors would start on new pavements and roadway along the northern stretch of The Kingsway once those along the south side were completed. “The feedback has been pretty good in terms of the roadworks,” said Mr Mowbray. “We are working on a daily basis with businesses and other users of The Kingsway. He said the pavements would be wider than previously, and that new trees would be planted. The new layouts on The Kingsway, Orchard Street — plus Mansel Street, De La Beche Street, Grove Place, Alexandra Road and Belle Vue Way — are all due to be finished later this year. “It will change the whole area significantly — the reason is to stimulate private investment,” said Mr Mowbray. Mr Mowbray said architects were producing designs for a new tech-led office development at the Oceana site in The Kingsway, and that demolition of buildings to create a link to Oxford Street would be completed shortly, although the link would only open when the office development was built. 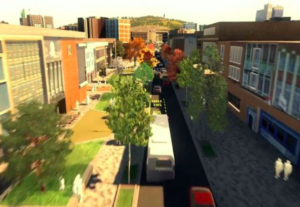 Demand for the new office development – also known as the Digital Village – was being explored with universities and businesses, and workshops have been held. It is expected to cater for 400 workers when built by 2021. Arguably the key piece in the regeneration jigsaw is the 3,500-seater indoor arena planned for south of Oystermouth Road. Mr Mowbray said the council had selected a main contractor, which would work with the council on the next stage of design. Clad in anodised gold panels, the arena will host high-profile concerts, musicals and conferences. 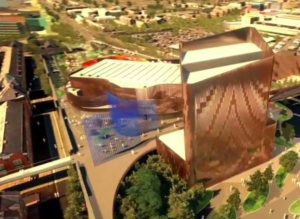 Warranties still need to be signed off by arena operator Ambassador Theatre Group (ATG), which will maintain the building, but Mr Mowbray said there was no reason why this would not happen. 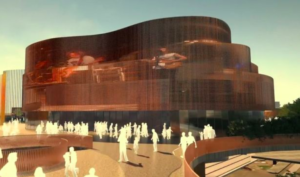 Work on the arena will start this year and kick-start the £130 million Swansea Central phase one project, featuring a new park, multi-storey car parking, commercial and residential units, and a pedestrian bridge across Oystermouth Road. The council will borrow to fund much of this £130 million development, although £22.5 million is due to come from the City Deal for the region. But City Deal funding will only be released once the relevant business cases are signed off, and a separate City Deal governance review is concluded. Opposition councillors are keeping a close eye on finances. The indoor arena is due to be completed by the end of 2020. 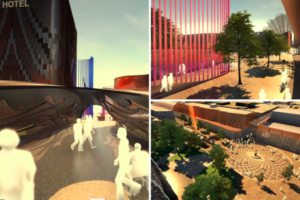 Also proposed next to the arena is a hotel, which would be paid for by the private sector with top-up funding likely from the Welsh Government’s tourism arm, Visit Wales. Mr Mowbray said he expected hotel bids to be submitted by the end of January. The footprint of the hotel has been moved slightly away from the marina and towards Tesco, due to right to light issues for marina residents. 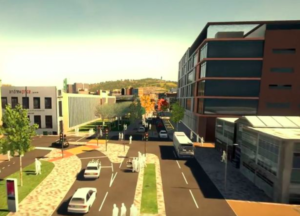 Panel chairman, Councillor Jeff Jones, asked if the City Deal business case was holding up the delivery of the Swansea Central phase one scheme. “No, not at the moment,” said Mr Mowbray. New Zealand company Skyline Enterprises is looking into a £50 million-plus investment, which would also result in a new hill-top restaurant and cafe. Skyline bosses have met Swansea Council chiefs, the Welsh Government and environment body Natural Resources Wales (NRW). Mr Mowbray said many of the trees on the 630ft hill weren’t native ones. “The ecology is not that great at the moment,” he said. NRW and the council, he added, had very few resources. Mr Mowbray said Skyline Enterprises had a good track record of improving the ecology of sites it ran elsewhere in the world, albeit new buildings and tracks for luges were required. 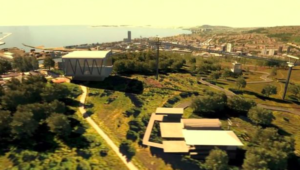 If the Kilvey Hill scheme progresses, negotiations would have to take place with landowners including the Duke of Beaufort. The preferred location for the base of the gondola ride is the Landore park and ride overflow area. Mr Mowbray said a wider parking strategy for the city was looking into the idea of moving this overflow facility to Swansea Vale. 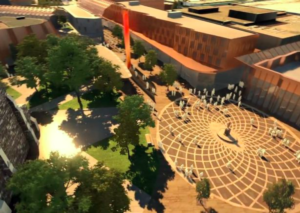 The council wants a new-look square, potentially with a restaurant or commercial units, and more greenery. Interviews with bidders to take proposals forward are expected to take place this month. 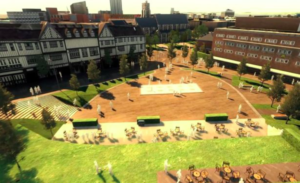 The square would remain in public ownership if it is developed. Meanwhile, delivery firm DPD will be the first tenant at Parc Felindre, north of the M4. It now has planning permission for a large warehouse and anticipates the creation of 380 jobs – mostly owner-drivers – when at full capacity. The scrutiny panel heard that no more public money was needed to prepare the business park for use. Many millions of pounds have been spent on it already. Mr Mowbray added that experts were looking into how Swansea Central phase two could create an “experience economy” due to the difficulties facing the retail sector. Phase two would focus just on the north of Oystermouth Road, and comprise shops, restaurants, leisure, housing and academic space. Councillor Chris Holley asked if “click and collect” venues, like those proposed by online giant Amazon, could be explored. “Retail is virtually dead everywhere,” he said. Mr Mowbray said retail was in difficulty but that city centres were not dead. “There is a way forward,” he said. Mr Mowbray also revealed that Wales’ counter-terrorism police unit, Wectu, was being consulted on these big regeneration schemes to ensure public protection. Measures will also be taken to try to reduce crime and anti-social behaviour – known as designing out crime.